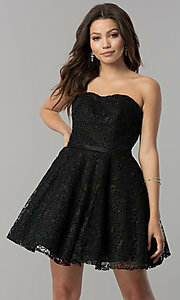 An adorable designer dress by Alyce Paris, this short lace homecoming dress is a feminine and youthful style for hoco 2019. An intricately-detailed sheer-lace overlay on the strapless party dress graces a coordinating lining from the sweetheart neck to the short hem. A shiny ribbon at the natural waistline loops around to cross the back cut out as it provides definition above the flattering gently-flared a-line skirt . 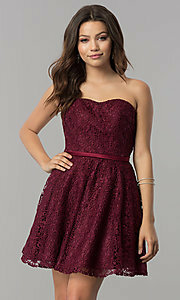 Reasonably priced under $150, this short lace Alyce hoco dress is an affordable, yet enchanting choice, for homecoming, sweet-sixteen celebrations and other semi-formal events.